Initial impressions of the Shuffle were great. Apple's packaging didn't disappoint, and setup was exactly as you'd expect from connecting an Apple peripheral to an Apple computer: just plug it in and it works. The Autofill feature in iTunes is excellent: pick a source playlist (or your complete Library) and click Autofill. This feature is so useful that I'm not sure why Apple doesn't enable it on every iPod. Very few people would need it on the biggest iPods, since most people's music collections are much smaller than 60 GB, but it would be extremely useful on the Mini and the Nano. Filling it up takes a while. With my 1 GB model, a complete fill from empty takes about 15 minutes. This isn't too bad, considering how long it would take to burn the songs onto the equivalent amount of audio CDs, but it can seem like an eternity if you need to go somewhere and get stuck waiting for it. It's supposed to be a device for people "on the go". I thought this wasn't going to be a problem. For primarily car use, you don't need to look at the screen most of the time anyway. But there are a few negative scenarios that occur more often than I expected. I'll sometimes get a song stuck in my head and want to listen to it, and I know it's on the Shuffle, but finding it is completely impractical. There's no menu available, of course, but there's also no way to indicate which track is currently playing - so when flipping through tracks, I have to wait until the song begins to play so I can identify it, instead of glancing at the title on a screen in a fraction of a second. There's also the rare occasion that I don't recognize the song that's playing, and I'd like to know its title. I might want to learn the name of a very good song, such as a random middle track in the Alice In Chains Unplugged album. Or I might want to delete a very bad song from my Library, such as a random middle track in Trio's Da Da Da album. When playing very long tracks, such as audiobooks or radio shows, there's no indication of how long the track is or how much time remains. When the content is split into multiple tracks, there's no way to tell which track is playing, so it's difficult to listen to part of an audiobook on my Shuffle and try to resume it later on my Powerbook. Because there's no screen and minimal controls, there are a few typical iPod features that aren't present. While most wouldn't matter without a screen, such as the Breakout game or the PIM functionality, I'd certainly love to have an equalizer and a way to rate songs. The equalizer, in particular, is sorely missed when I use certain headphones or speakers that can sound great only with adjustments. One critical control is absent: a "hold" switch, which disables button-presses until it's switched off. This is great when you're keeping a device in your pocket or a bag in which it's possible for buttons to be accidentally pressed. The Shuffle offers no such luxury, even though it's been on almost every portable music player for the past 15 years. Other than these detractions, the iPod Shuffle has excellent sound quality. I was unable to detect a difference between the Shuffle and my Powerbook using very good headphones. It's able to drive most headphones to very loud volumes. Despite common claims and misconceptions, Apple's products do have bugs. They just tend to have fewer of them than everyone else's. The Shuffle had a critical flaw that would make it completely lock up when attempting to play certain tracks purchased from the iTunes Music Store. This happened with two new Stroke 9 tracks I purchased, "Thanks for Playing" and "Liar". A few threads on various forums indicated that other people had similar trouble with a wide variety of songs, all purchased from the iTunes Music Store. I went to the local Apple Store and the people at the Genius Bar (that's what Apple calls their in-store tech support) tried everything from swapping it with a new Shuffle to buying the same tracks on a separate computer with a separate account. The Geniuses were stumped, so it was elevated to the national support people, who were supposed to call me within 24 hours. They didn't. A month later, Apple quietly released a Shuffle software update that fixed this problem. Now it can play these tracks, but it can't seek within them. There are other minor bugs, too. Sometimes, after being turned on, playback doesn't resume from the proper track. Sometimes it won't be recognized by iTunes when it's plugged in, or it will get upset even though I ejected it properly. Sometimes it will forget my playlist order and shuffle it for me, even though it's in "play in order" mode, and no amount of playing with the slider switch will fix it until I reconnect it to the computer. But the lack of a screen is more annoying than I expected. Having a gigabyte of music without a good way to navigate it is very limiting. And the bugs make this process even more frustrating and difficult. 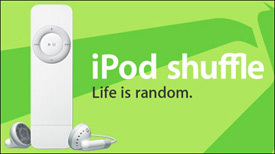 Unless the size is absolutely critical, I recommend that you save up and get the iPod Nano instead. Even if all of the Nano screen-scratching rumors are true, a heavily scratched screen is better than no screen.